Best record I bought in Austin, hands down. I’d been waiting to hear more Space Lady material ever since two of her tracks appeared on the Songs In The Key Of Z compilations, which of course were my major introduction to the world of outsider music, in conjunction with Irwin Chusid’s book of the same title. 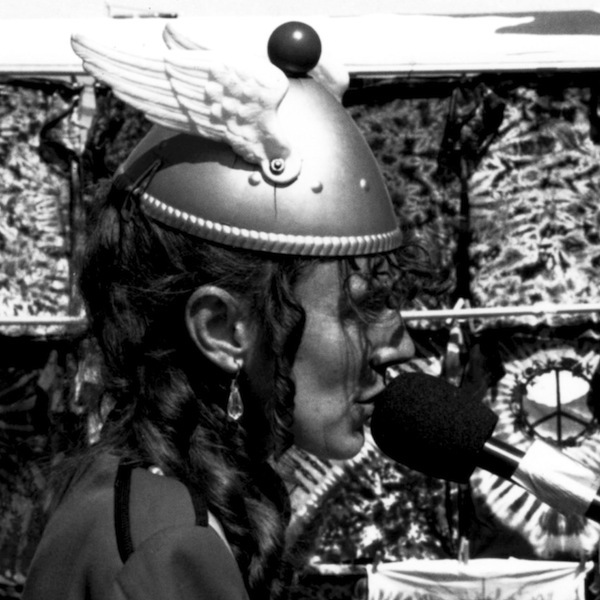 If you haven’t read that book or listened to those compilations, The Space Lady is a street performer who performs ethereal Casio covers of pop songs to passers-by, wearing a helmet with wings and a blinking red light. She was active throughout the ’80s and ’90s, retired the act around 2000, but recently started playing again around Colorado and New Mexico due to popular demand. Most of the tracks here are covers of ’70s and ’80s pop/classic rock tunes, most notably her version of Peter Schilling’s “Major Tom”, which is far more haunting and timeless than the dated-sounding original. Even though I would be perfectly content with never hearing “Fly Like An Eagle” or “Born To Be Wild” again, her simple, spacey, echo-drenched reinterpretations take the familiar songs somewhere else entirely. She even manages the impossible feat of turning an ELO song into something I actually really enjoy, with a truly chilling version of “Domine, Libra Nos/Showdown”. And there’s also a few original tunes, written by her then-partner Joel Dunsany, which generally seem to be about her act, performing simple electronic pop songs (“Synthesize Me” says it all). Definitely bridges the gap between Bruce Haack and more recent naive Casio-pop experimenters such as Dan Deacon. I bought this on vinyl, which includes a download card of the entire album as well as the bonus tracks from the CD version, which includes covers of The Doors, Elvis and “Radar Love”. And for more Space Lady, there’s a free digital EP on Comfort Stand.